Leaked Year of the Horse Plushies! | Angel's Rilakkuma Blog! This entry was posted in Uncategorized and tagged 2014, Chinese, horse, Japan, kawaii, kiiroitori, korilakkuma, leaked, news, plushie, rilakkuma, san-x, stuffed animal, zodiac by Angel. Bookmark the permalink. 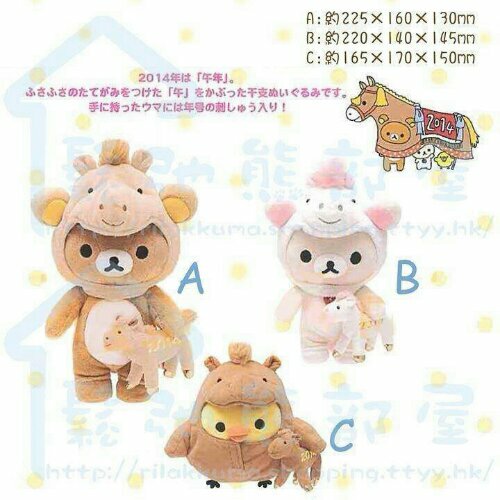 Yup it would be awesome if San-X made a plush of the big horse plushie with rila kori n kiiroitori under it! Omg yes! I would totally love one like that!! Oh these are so cute!! Agreed they should make a big one 🙂 Thanks for sharing I can’t wait to get these!